5 speed gearbox. Chain drive. 41 mm diameter leading axle forks. Front:Ø 256 mm dual discs with two pistons per caliper. Rear:240 mm diameter disc with single piston caliper. Spoked with aluminium rim. TL spokes to rear wheel. 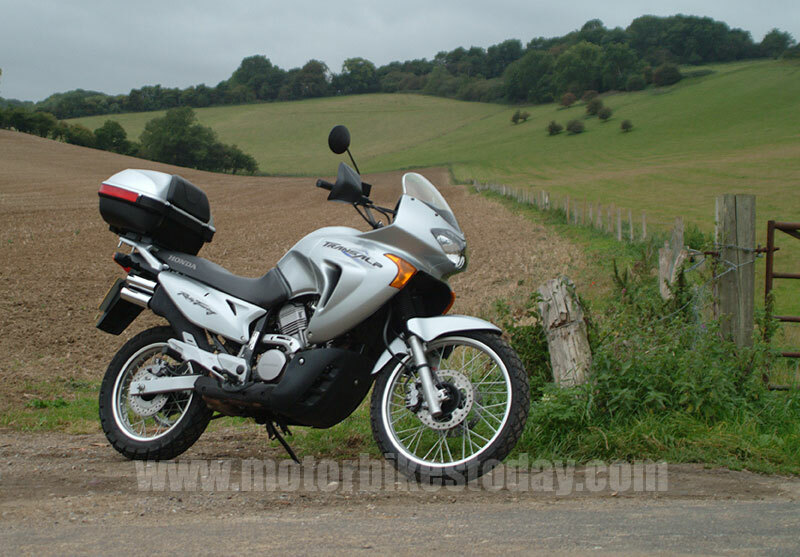 Honda have a long and glorious tradition of providing vee twins to the UK market which have a particular attraction to couriers. From the CX500 of the seventies through the CX650 of the early eighties and the NTV650 of the late eighties and early nineties, these bikes have been sat firmly at the utility end of the market and have been as common on our city streets as black cabs and Routemaster buses. 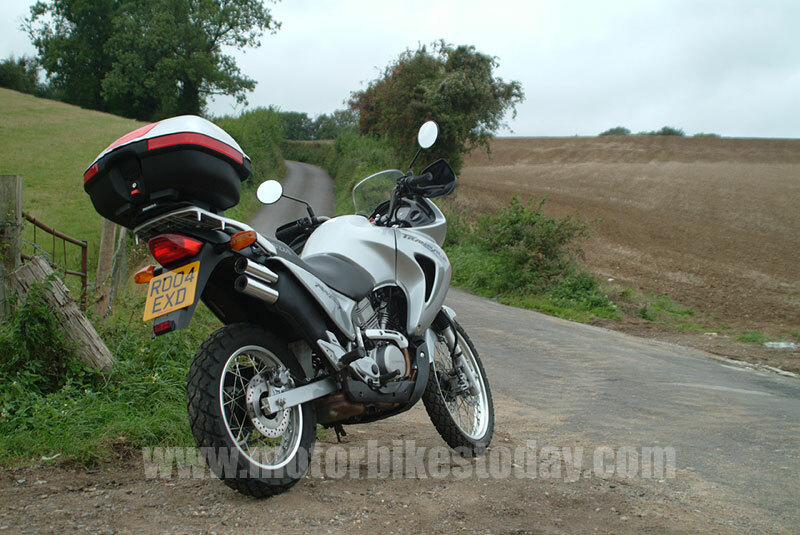 But with the increasing popularity of large trail bikes coinciding with a decline in enthusiasm for the undeniably capable but equally dull NTV650, Honda struck on the idea of installing the perfectly good engine and transmission in a monster trail frame. the result was the Transalp. Now if you are in the market for a fire breathing animal then I suggest you look elsewhere on the dealer’s floor. With a dry weight of 191kg and just 52bhp, performance is best described as adequate, though in fairness the Transalp is perfectly quick enough for the roles which suit it best. More on this later. Bringing the Transalp back from Honda’s offices on the trailer I was struck with a problem. Without even riding the bike I had already taken a dislike to it. It was heavy and, unusually for a trailie, it was very difficult to strap down securely. Every bump saw it wallow on the soft suspension, tie-down straps flapping alarmingly. It was also, not to put too fine a point on it, sinfully ugly from the angle I was seeing it, not helped, in my opinion at least, by the unflattering silver paintwork. Fighting my way back through the Croydon traffic my affection for the bike didn’t increase. Having unloaded the bike and unhitched the trailer I was then greeted by the news that an accident had mucked up traffic in Croydon even further, which was just dandy as I had to go and get my daughter from school. Fortunately, the guys at Honda had fitted a top box to this particular test bike. And equally fortunately, my daughter is old enough to go on the back and has her own kit. So, spare helmet and so on in the top box, off we went to school. The Transalp is extremely easy to ride. No, really. I cannot think of an easier bike to just get on and ride. Totally unthreatening and completely neutral, the high, wide bars give loads of leverage for low speed work while the soft suspension makes for an extremely forgiving ride. Filtering through traffic was a doddle, and the excellent mirrors gave me both a clear view behind and space above car door mirrors. Schoolbags in the box and daughter on the back, it was time to head home. Now things got interesting. Cautious filtering was surprisingly difficult, with the Transalp showing an alarming lack of stability at careful parent filtering speeds. Indeed, it was only when my daughter started thumping me on the back and telling me to get a move on that things became more manageable. And when I reverted to type, filtering rather more aggressively (though still leaving a bigger margin than usual) the Transalp proved more than up to the task and in fact became a fairly pleasant travelling companion. The slight duality of character required further investigation, so I took a scenic route involving both the best and the worst of local roads on the way to find a location for the photo shoot. What I discovered was that, surprisingly for a bike like this, the Transalp appreciates being shown a firm hand. What was even more of a surprise, for me at least, was the way that the Transalp responded to enthusiastic riding. While remaining totally forgiving and neutral, the Transalp could be stuffed into corners with surprising vigour and was perfectly happy to receive large handfuls of throttle at all sorts of inappropriate times, steadily refusing to get even slightly out of hand. While some of that is surely down to a lack of power, the rest is due to some pretty good chassis design. We really ought to pay some attention to the engine. Because it’s old. In fact, by mainstream Honda standards, it’s positively prehistoric, being blessed with a pair of carburettors and three valves with just one overhead cam per cylinder. The exhaust is neat, exiting in a stacked pair of pipes on the right and looking far more businesslike than is really warranted. The clutch is light and positive, and the gearbox is typically slick. Throttle action is light and the carburation is spot on, with no glitches or hiccups at all provided that you have remembered to set (and turn off) the choke, situated below the tank on the left. Yes, just where the choke always used to be. With little vibration and a friendly character, the engine goes a long way to make up for its lack of get up and go by simply being easy to live with. Which is no bad thing. Chassis-wise, the Transalp continues in much the same theme. The technology is old but tried and tested while styling is very much take it or leave it but utterly practical at the same time. 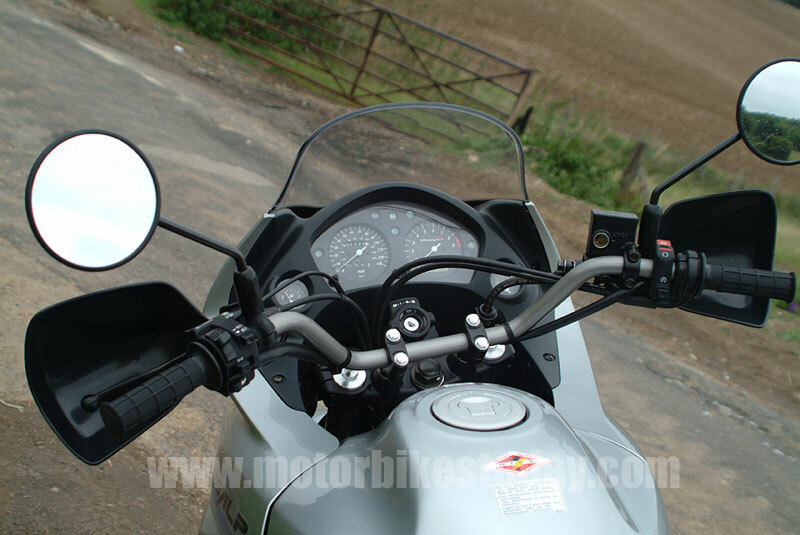 The small rack which is fitted as standard takes a standard topbox without problem, though the one fitted was actually intended for a VFR800 but was installed as an emergency measure as we were likely to be taking the Transalp to Europe. But it did the job nicely anyway. Talking of Europe, the Transalp is very, very popular with our continental cousins. Monster trailies are a big thing in Europe, and the Transalp, while by no means the best on the market, is certainly one of the most accessible. 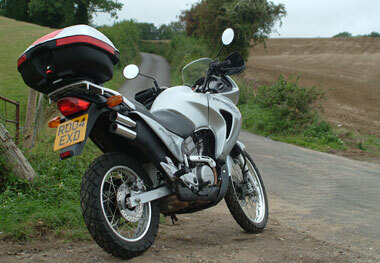 The Transalp is a large, heavy and rather softly sprung motorcycle. And I am not an off-road expert. So our offroad experience during this test consisted of a few hundred yards across a field looking for a good photography spot. This told me that the Transalp would do it if necessary but that offroad work was not the natural domain of bikes like this, no matter how many bash plates and brush guards are fitted. However, on the way to this field I needed to ride down several miles of unlisted road, accessed by several more miles of B road. And the Transalp excelled, the high riding position affording a great view of upcoming hazards, the wide bars giving great leverage for tight corners and the soft power delivery and forgiving handling allowing a sprightly exit from those corners. And urban riding, once the bull has been grasped by the horns, is straightforward enough though the soft suspension can result in some extreme pogoing action when filtering hard and the weedy horn may as well not exist – a bad thing in town. Dual carriageways and fast A roads are a chore best avoided – the Transalp lacks the power to tackle them with authority and sounds, and feels, strained and thrashy at faster cruising speeds. The Transalp is a very difficult bike to dislike. The styling, while unlikely to win any awards, stopped grating after a short time, and the effective fairing and screen were very welcome when the weather turned a little nasty. 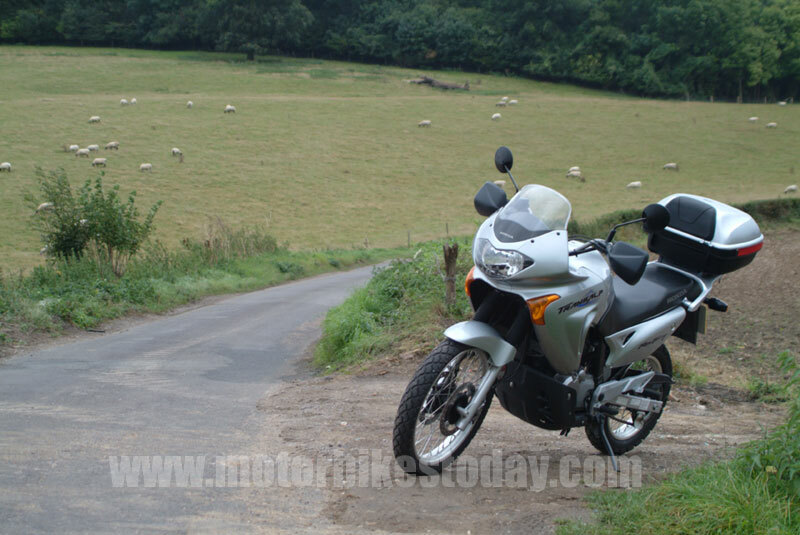 The smooth and amiable engine was easy to live with and the handling was better than expected. But you know, the Transalp is also a rather difficult bike to like as well. It certainly did nothing wrong as such, and it is not, I hasten to add, a bad bike. Far from it. 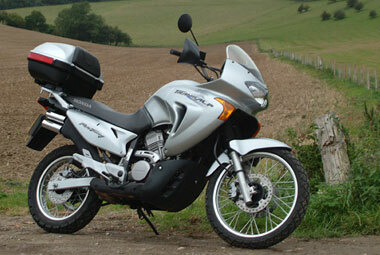 But it is, and I know I am going to regret saying this, rather a dull bike. 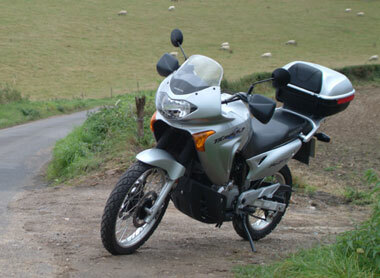 However, the Transalp is very, very easy to ride and is incredibly practical. It is also cheap, at just over five grand on the road. Were I in the market for a reliable workhorse for, say, a daily commute into town with minimal mechanical attention or affection needed then the Transalp would be very near the top of my list.